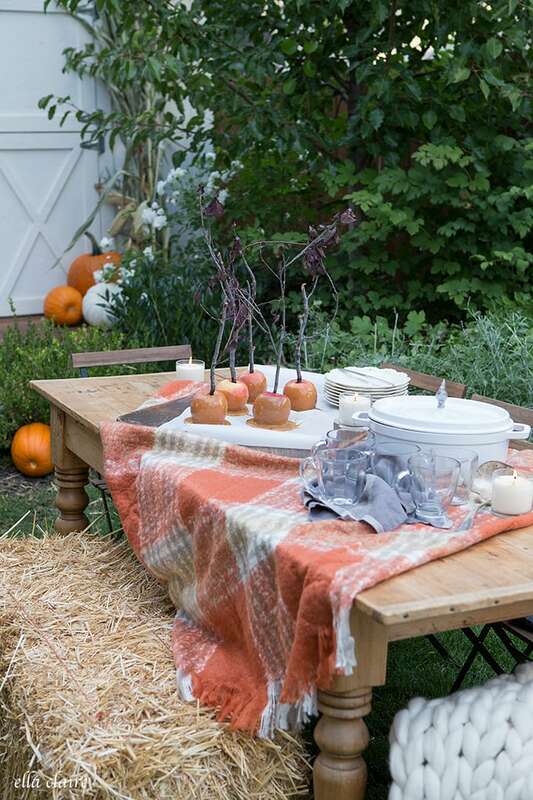 A simple, family friendly Fall table for cozy outdoor entertaining, complete with caramel apples, hot wassail and the year’s bounty of pumpkins. 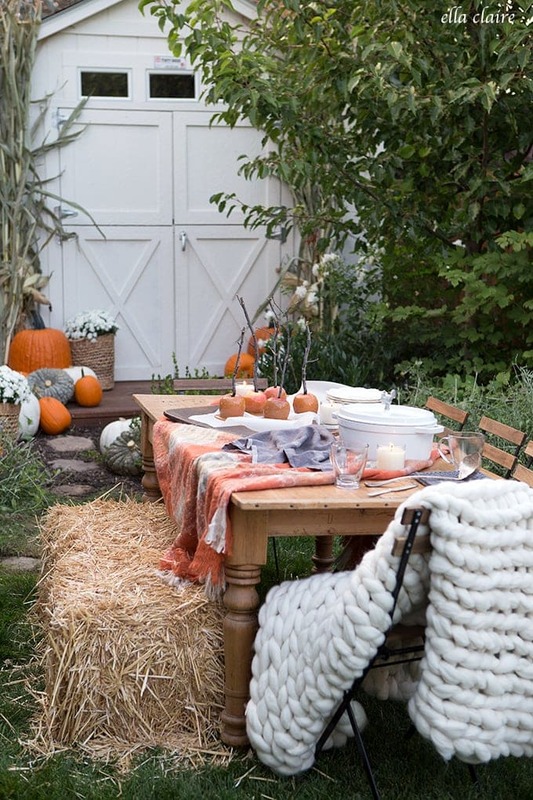 I have wanted to pull together a cozy little Fall table out in front of my she shed for a couple of years now. 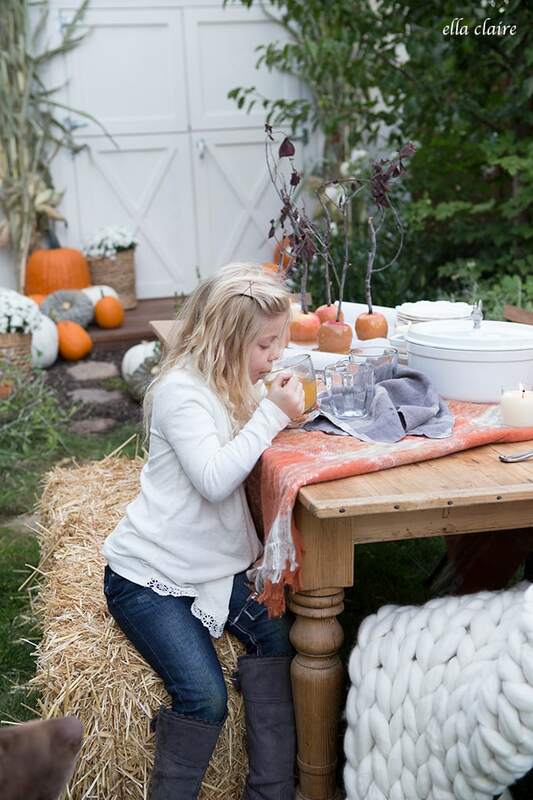 I thought it would be fun for our little family to visit and share treats outside at a pretty Autumn table. Our Seasons of Home tour was the perfect opportunity since we are sharing porches and patios this week. Joss and Main also partnered with us so you might see a couple of fun new things in this space. 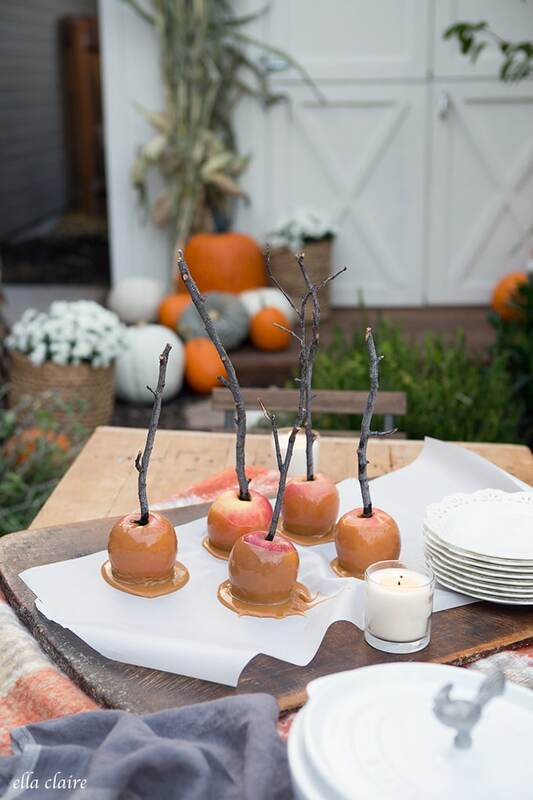 Our weather has been so beautiful and crisp lately which has put us in the mood for soup, apple cider, caramel apples, hayrides and warm fuzzy throws. I absolutely love this time of year. We made yummy caramel apples with my favorite caramel recipe (here). 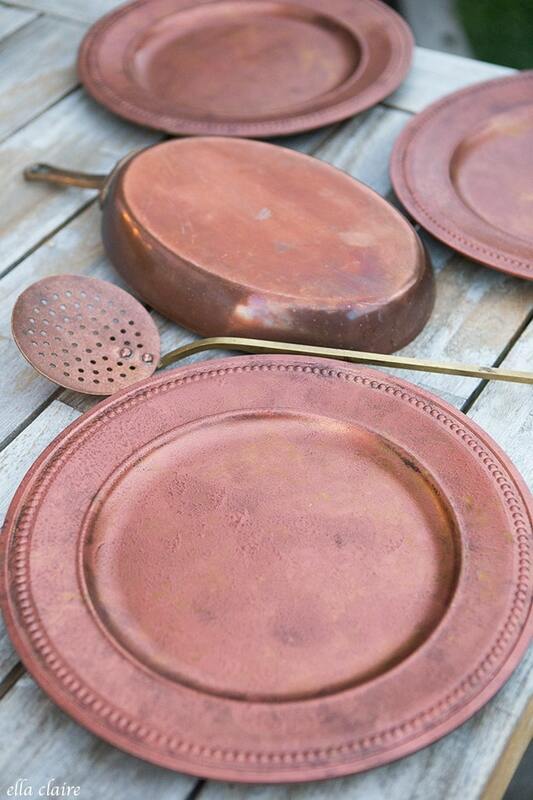 I will share another post with more details another day, but they are always a big hit with my hubby and kids. 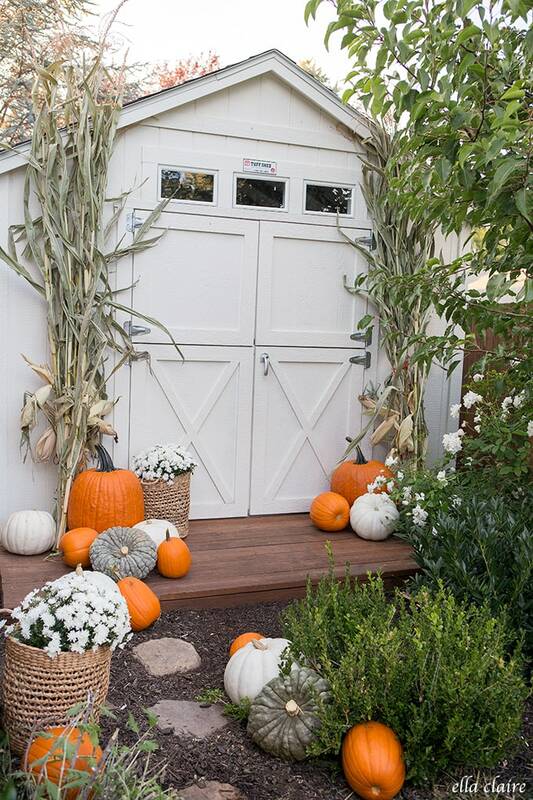 I love my little shed porch and knew it would be so sweet with all of our fun pumpkins. 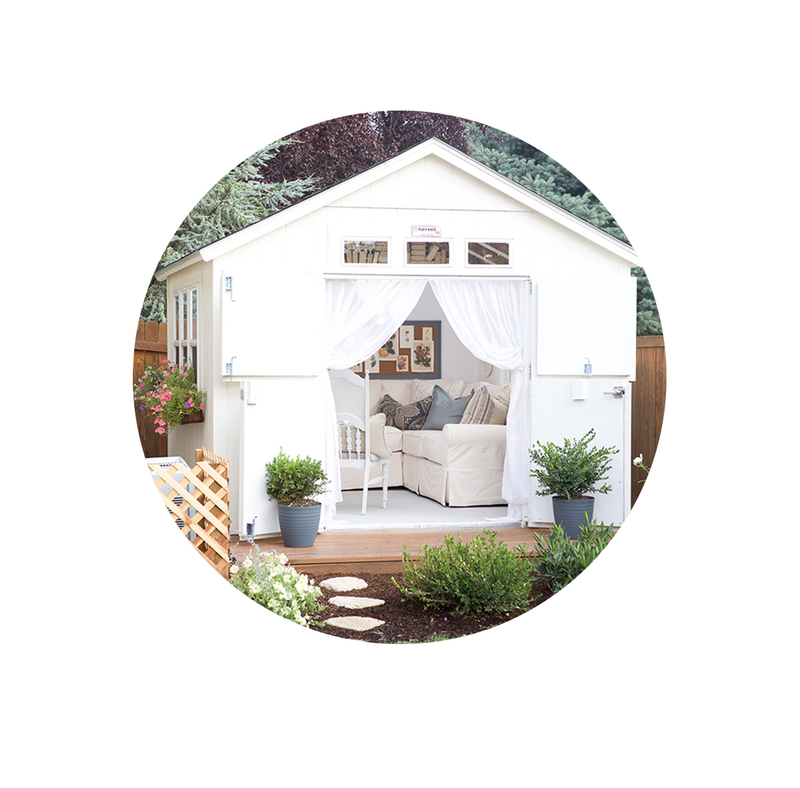 My hubby and I built this deck/porch when we finished the she shed a couple years ago and I have thought many times about how fun it would be to decorate it for Fall. I gathered all of our pumpkins and my sweet husband brought these enormous corn stalks home for me to play with. The smaller orange pumpkins are all from our garden this year and the rest are from a local farm. These babies have my heart. 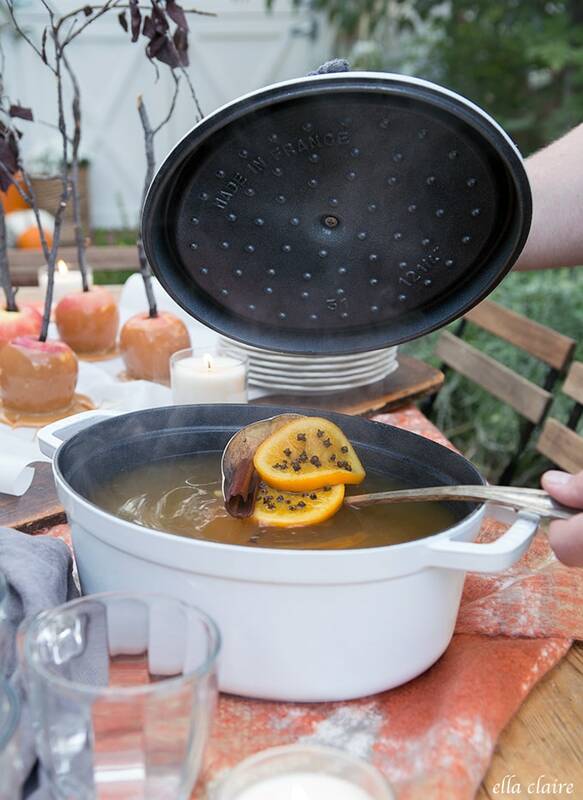 One of our very favorite things is apple cider and wassail in the Fall. We sat and sipped and giggled while we enjoyed our drinks. I need to share this recipe with you. It is a good one! Joss and Main sent over my favorite little Cocotte. I love Staub cocottes; they cook everything so beautifully and are definitely worth the investment. 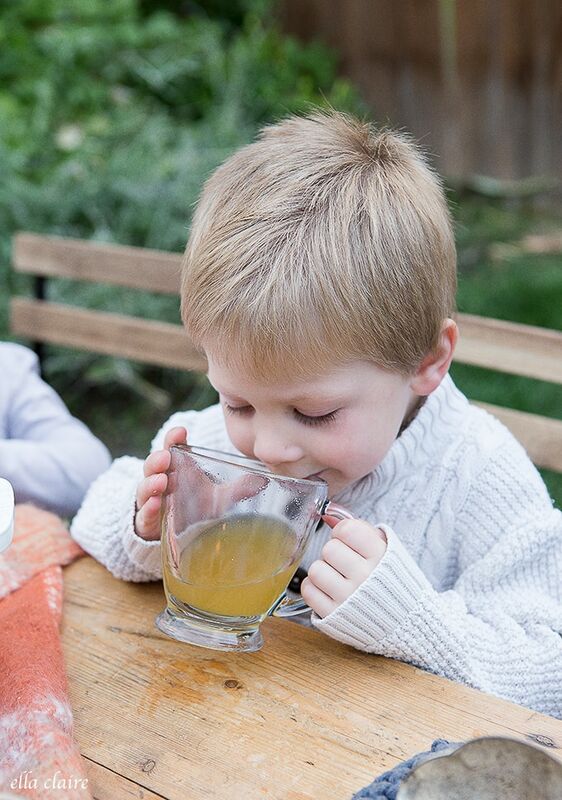 Anyhow, I simmered our little pot of wassail and we enjoyed it so much. I also ordered this chunky wool throw that I am in love with. I have had my eye on it for years now and I can’t quite decide which room in my home it will stay in. I keep moving it from room to room; it is so fun. Oh, these faces. My heart. 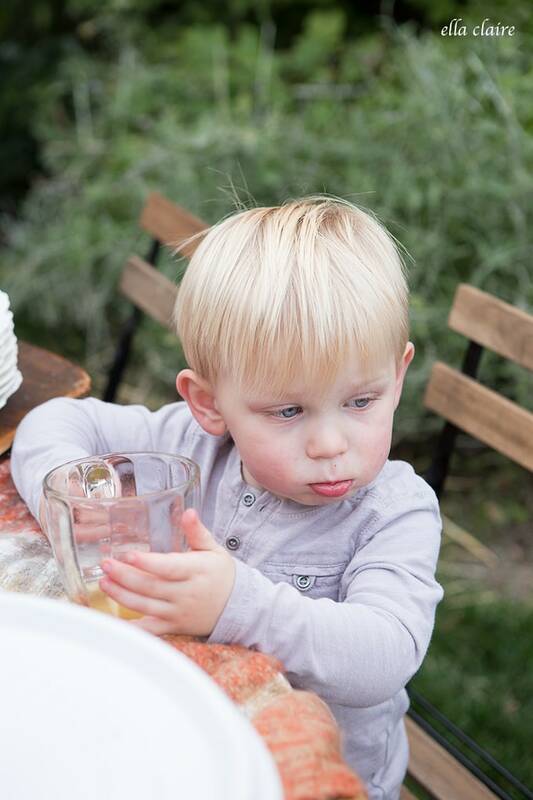 The funny thing about our little Fall outdoor visit is that things didn’t really go as planned. I think sometimes things are better when they don’t. There are finger marks in the caramel apples where my littles were trying to sneak tastes. The leaves on our trees haven’t turned yet. Our shrubs are wild and crazy. 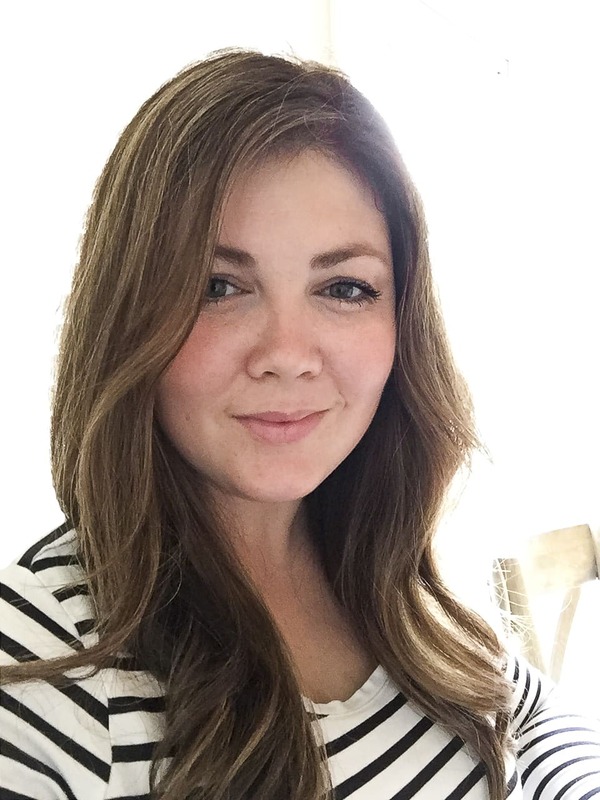 Some of my pictures (like this one below) were even taken during the aftermath of our little visit, so nothing it really “styled” or perfect. It is just how we left things while everyone took a little jump on the trampoline behind me. But this is our perfectly imperfect little life. 3 babies with another one on the way, wild, crazy, happy, loud, and full of love. I savor this season. 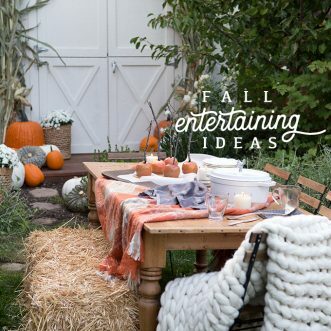 I hope you get a minute to visit these other beautiful fall porches and patios in our series! And please visit my Instagram to learn more about the fun #designtheoutdoors contest that Joss and Main is running right now. Oh my goodness, all so beautiful! 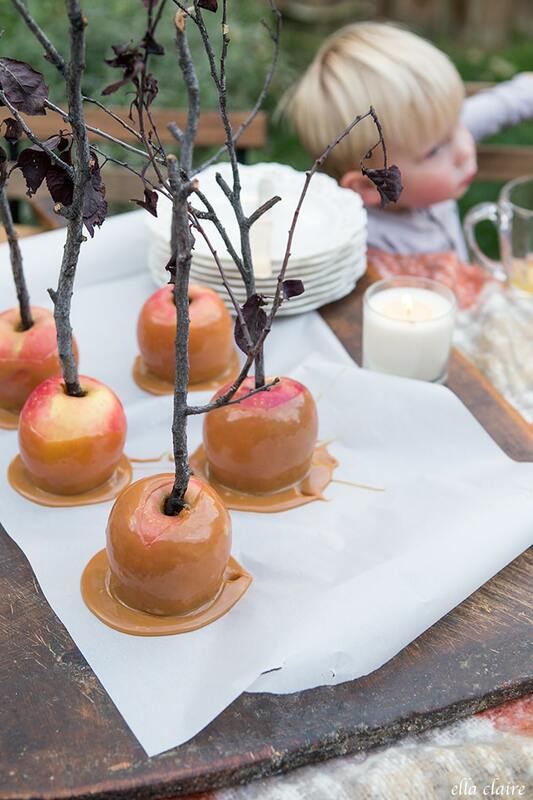 Those caramel apples are darling and so are your kiddos.